Romeo is a sweet male cat, who showed up asking for shelter this bitter February winter. 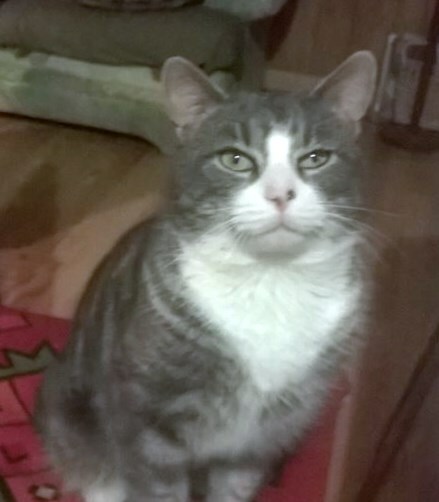 His foster mom describes him as a mellow guy, who likes affection but isn't in your face. He adjusts to dogs, possibly not good with other cats, (all cat interactions so far were as an un-neutered intruder) but good and gentle with kids. He's very well behaved, and doesn't doesn't jump on things he isn't supposed to. He's playful if you try and play with him but won't bug you to, and he's an overall easygoing sweetheart. He has been called Archie, Stormy, Romeo...he is open to a name and a home! Is this the well rounded winter lap warmer for you?